Water is a precious natural resource of limited quantity and it is vital that we treat it as such. Perhaps even more so in the arid desert southwest, where many operations utilize flood irrigation systems without much consideration of the quantities of water actually being consumed. In recent months, unregulated agricultural water use has come under closer scrutiny in some Arizona communities. While there is much public discussion and regulations in place to protect our urban resources in the form of a drought preparedness plan, we would prefer to focus on develop a viable scalable plan to conserve agricultural consumption now rather than later and not continue to draw down on our existing aquifers. 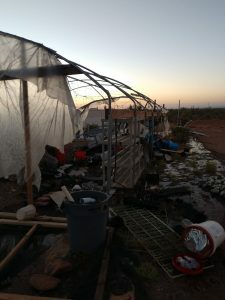 As a newly established permaculture test site in the Sonoran desert of Arizona, a critical element for us is water and the careful management of this critical resource. A priority for us, at Viking Agriculture, is to find ways to efficiently use and potentially re-use our natural resources to establish reliable systems to support and maintain nutrient dense food production. We feel that this is socially responsible and aligns with our core ethics. In other words, can we create a smarter, more efficient way to use the limited water resources that we have and still produce a high quality product? Equally important to us is the development of such systems that would pose limited negative impact on our soil. Current watering strategies used throughout this region include flood irrigation, surface watering and drip irrigation. These methods are deployed in various operations from the backyard hobbyist, to the market gardener as well as in larger commercial operations. At Viking Agriculture, we currently rely on a timed drip irrigation system in our permaculture test zone. This system provides sufficient moisture to our crops as well as providing a water source for the apiary that is also housed on the property. However, since one of our core values is to find ways to more efficiently use and potentially, to re-use our natural resources, it is of vital importance that we continue to improve on our current model to increase our bottom line while being socially responsible. Of equal importance, is to insure that any new systems that are implemented will limit impact on soil erosion and nutrient depletion while potentially increasing production of consumable product. Currently, we are experiencing some water loss through evaporation and runoff which, in turn, contributes to soil compaction and erosion. For the research component of our project, we propose to conserve and potentially reuse our water through the creation of grow beds with a subterranean irrigation system. Furthermore, we are interested in testing an additional variable incorporated into our model, aeration, and measuring its impact on the growth rate and health of our crop. Our experimental design is based on the general principles behind a passive hydroponics system and taking to another level; a passive subterranean irrigation system. To this end we will be deploying two techniques; a set of raised beds (popular to many local and home producers) and a traditional crop row system (common in both large scale and market garden productions). Construction of this model includes the production of a series of moisture tight grow beds with water bank, a moisture wicking mat as a barrier between the water and soil material, clay aggregate substrate and topping off with local dirt, compost and soil amendment mixture. A select group of seasonal drought tolerant seeds and starters will be planted into one of three variations of the grow bed; with water bank, with water bank and aeration or without water bank. Data to be collected includes; quantity of water used, growth rate of plants, product yield, fecundity, and nutritional content of the resulting produce. Additional projects may also incorporate surface watering or drip irrigation as a supplemental water source. For the educational component of our project, we propose to share our process and resulting data with the community at large in a variety of formats. This may include presenting our project at local conferences and schools, hosting workshops, and conducting on-site tours. Our plan is to record the process from start to finish and be presented online as a youtube video documentary series. In addition, we hope to publish our results in publications that are readily available to other farmers as well as the general public. Open source downloadable materials; lesson plans, instructions, data results, will be made available through Viking Agriculture’s website and social media pages, i.e. facebook. We will be incorporating STEM (science/technology/engineering/math) themes throughout our deliverables in hopes of influencing the next generation of environmentally conscious farmers and scientists. Unable to test Salanova (pelleted lettuce) due to high demand for the seed and only one provider in the US (JohnnySeeds). And looking for a suitable replacement. The pelleted lettuce produced better than average yields in the fall of 2017. Cegolain or possibly Dragoon will serve as a substitution as both of them perform well in the arid climates. Also may have to shift from the existing indeterminate variety Toronjina to something like Sakura due to the Toronjina having a poor germination rate on the site for some reason. This could be the seed lot from the supplier but all in all, it has not performed well in either the irrigation batteries or the soil method. Sakura was a fallback option for the indeterminate tomato strain due to hardiness and ease of management. Water ratios are undefined at this time due to leaking issues (see below) that are preventing accurate measurements of consumption via plant transpiration and environment evaporation. Passive Irrigation Batteries (raised bed) May 2018. Indeterminate Tomato, Cucumber, and Kale produced mature fruiting and edible plants 13% faster than traditional growing methods after transplanting into the system. Toronjina is not performing as well as we have seen historically. Directly seeded varieties of Cucumber, Chinese cabbage varieties, Kale and Chard produced matured plants approximately at the same rate through germination but showed an 8% improvement to maturity after germination. No noticeable increase in growth or yield was realized with regard to herbs and peppers. Radish did not perform in the irrigation battery system and produced normally in the traditional soil-based method. 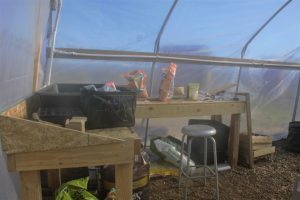 As we have many visitors during the spring, multiple “mental” tours have occurred with local market garden operations as well as consultation to 2 nurseries. We have also been helping local homeschoolers to provide curriculum and a practical application space for students. Once we have final findings we will be producing a YouTube video with step by step instructions to include creation of the Power Control Unit, Water Control Unit, Irrigation Batteries Construction and grow media selection. Also a solar step by step for individuals choosing to power the process via solar panels and energy storage in the form of batteries. We also have been approached by a company that designs robotic farming for small-scale farming solutions. Leaking -. As the irrigation batteries are designed to be a sealed system in order to measure water intake requirements versus that of traditional in-ground growing methods, multiple leaks either in the liners used or in the plumbing of the beds to the water management unit became problematic. Repairing these leaks often times was not an option due to mature plants existing in the growing system when the leaks became apparent. Leaks also prevented accurate measurement of the water being used in contrast to soil methods. While core perception is that the irrigation batteries were indeed using less water than the traditional method, exact metrics are unavailable due to this issue. One goal of this study is to understand how effective subterranean irrigation is versus traditional methods when it comes to water use. In 2017 we discovered that this reduction was 22%, and significant enough to contrast in 2018. Either re-construction or re-design of the irrigation batteries will be necessary to accurately measure this in fall of 2018. During the summer of 2018 we will be re-lining the irrigation batteries with use bilboard tarps. These tarps can be patched to a water tight level and are also much thicker than the liners currently deployed. This should address issues with leaking due to wear and tear on the liner. Weight – Due to construction materials used in this version of the irrigation batteries, grow media, plants and most importantly water being retained in the system, the weight of the V1 is difficult to manage from a workflow and flexibility perspective. In addition, the construction media for V1 (3/4″ plywood bottoms) began bowing when under the load of the system. This bowing was partly responsible for the leaks mentioned above and required the system to be drained and lifted onto a makeshift support system. Doing so didn’t appear to harm the growth of the plants surviving the move but some loss did occur. Footprint – V1 was designed to provide a modular feature that would allow access by humans and even robotic farming systems that became popular in 2017. The larger challenge with the version 1 irrigation batteries was semi-permanent placement is required. Lack of mobility and fixed plumbing/drain resulted in a fixed system approach which in some use cases would be fine but is not the desired result. Open air predation and pollination – As observed in 2017 the open air nature of the irrigation batteries led to crops being consumed by birds. This was the case in 2018 as well and is why the operation was moved into one of my greenhouses for the fall 2018 growing season. One core discovery I wanted to determine would be water loss due to evaporative and environmental factors (wind, sun). Due to the leaking of the V1 irrigation batteries and due to predation of the crop being able to accurately measure this is not possible. With this design. Either a temporary screened structure would need to be erected OR adjustment of desired outcome measurements will be necessary. Pollination has been excellent due to the many colonies of bees that we house on site (ranges between 20 and 200 depending on the season). Version 2 of the design was integrated into the greenhouse to include the use of some recycled hydroponics equipment that was being given away for free late 2017 with intent to compare and contrast against Version 1 in the open air for the Spring 2018 season. Portability- These “raceways” are ultra light and can be configured in multiple different configurations (vertical, stair configuration, horizontal). Also, this system could be disconnected and moved to a different location with very little labor impact. Scalability- In the event that scalability becomes needed or desired, adding additional raceways can be done economically and modularly. Adding 10 raceways to an existing system is in many ways as easy as adding just a single raceway. Durability- Raceways are made from rugged food grade plastics and provide a technological method to accomplish the same growing space with a lightweight, modular solution. One issue we discovered was that while lightweight and durable under a load of media, water, and plants a rack of some sort would be required to protect the raceways. Planting/implementation footprint – The use of 4 raceways provides nearly equal planting space as that of Version 1. Spring 2018 planting in these raceways has gone better than expected but there are some issues with plant sizes that can be used. In a bio-intensive method this isn’t an issue but figuring out the proper spacing for the test plants will be a major consideration going forward. First, the Lithium batteries can be discharged to 20% of nominal voltage whereas the Lead Acid batteries can only discharge to 45% of nominal voltage. This means that a smaller, less expensive and lighter lithium configuration can produce approximately 60% more storage than the lead-acid batteries being used currently. Second, if I were to deploy these irrigation batteries to an environment in need, the use of a lithium solution requires little to no education regarding battery management. It is quite literally a plug in and go option. Third, because recycled materials are widely available obtaining the initial batteries is actually as simple as calling either a local recycle center or most computer disposal companies where they can be obtained either for free or a nominal cost in comparison to a deep cycle battery suitable for external and longer-term use. Lastly, the lithium solutions are designed to be charged from full discharge to full charge thousands of times versus the lead-acid solutions that are designed to do approximately 400 cycles. This becomes an important consideration when leveraging solar charging controllers as the process is designed to leverage as much storage as possible daily before producing it as energy for use in the system. This might also mean a smaller, possibly flexible, solar panel can be used and produce more energy for the water control unit when considering scalability. As noted in 2017 we went through 6 generic big box store submersible and transfer pumps. While we are not moving all that much water we simply kept burning the pumps up. I have written this off to possible built-in obsolescence by the manufacturer and diagnostic/problem determination of the pumps is not within the scope of the study. In late 2017, after the season, I began testing 6 and 12VDC pumps commonly used in boating and marine applications. They are ruggedized and intended for long-term use in direct contact with the elements (rain, wind, sun, snow etc). They also are less costly as the original pumps and have approximately 30% less footprint requirement and approximately 60% reduced power requirement. The fall 2018 season will be tested with these pumps providing the water necessary to measure the irrigation battery efficiency. The water usage meters and accompanying Arduino sensor boards will be shifted to a direct current or mechanical option due to issues listed below. Today’s PCU is much like the original design with one big difference being planned for 2018. As stated above we are moving off of lead-acid batteries. Due to heat and weather conditions, we have gone through 3 of these 12v deep cycle batteries. And while they are certainly a good solution for RVs and Campers they are not a feasible solution for agricultural use in the elements. Even building waterproof and well-vented battery boxes simply weren’t enough to keep them in good usable condition as storage for the electronics and pumps. As stated above we will be removing AC Inverters from design because we are moving to DC powered pumps. These inverters take energy in the form of direct current (DC) and modulate/invert that current into alternating current (AC). Most household items run on alternating current and the pumps originally sized for the study required AC in order to perform. These inverters, even ones certified for external/marine use, simply do not handle the elements and burn out rather quickly. What that means is that while running daily operations to collect data and drive necessary water to the system if the inverter fails then no water and no data. It became painfully apparent that this was a big issue. My team was checking hourly on the inverters just to make sure they hadn’t blown up. Also, we had to keep multiple spares on hand that we could swap in should a failure occur. After burning 5 of these inverters up and on one occasion starting a small fire in the control area, we reached out to the forums and others in the solar industry for a solution. One solution was to use supercapacitors as a bankable and convertible energy option. Due to the volatile nature of high ferrod capacitors, this option was quickly dismissed. One small short circuit and fire becomes a serious reality. Likewise weather proofing supercapacitors is a tricky situation that requires 100% effectiveness. Finally, a colleague of mine up in Nederland Colorado sent me a non-submersible DC pump for testing (and modeling at scale). The pump tested well and the need for inverters in the current PCU expired. Weatherization of the PCU will be changed as well in the Fall of 2018. One reason is that the form factor can be much smaller than it was with the inverter (and the fans needed to keep that inverter cool) and the other because of new waterproof and weatherproof options on the market. Multiple disasterous situations have occurred via mother nature. 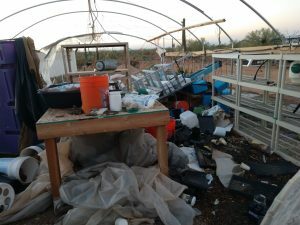 The monsoon season on site has resulted in multiple 40mph winds that have completely destroyed the greenhouse site used to germinate and test version 2 and provide a clean environment for the study in general. In August multiple 60-70mph horizontal rain/hail/wind days have not only completely destroyed that which wasn’t originally smashed but have destroyed additional components (solar panels, charge controllers etc) and have led to the destruction of 2 of the 4 raised irrigation batteries beyond repair. The remaining 2 will have to be completely re-lined and re-plumbed and tested for serviceability. 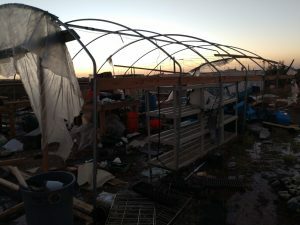 Detritus displaced by these winds also led to the puncturing of the 2500 ga cistern used to supply the greenhouse and irrigation batteries (both raised and in ground). Because of the sheer volume and mass of the fluid contained these cannot be patched and is now useless. 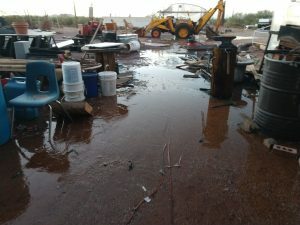 The result of 2500 gallons of pressurized water destroyed both distribution pumps, the one for the greenhouse and the other supplying the in ground irrigation batteries. While I am confident that I can re-build one of them. The other one burnt out due to electrical shorting of the motor and cannot be salvaged. Both supply compressors for water oxygenation are destroyed but spares are on site at the time of this report. 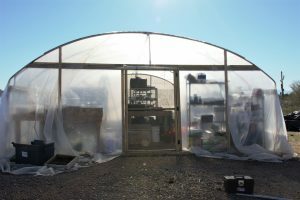 The greenhouse is almost completely destroyed and while not part of the initial materials submitted in this study served as the study’s HQ and the home of Version 2 testing. The raceways that were donated for Version 2.0 are no longer usable due to fracturing and breaking of the plastic by the rack purchased to house them. The rack and tables are salvageable. Nearly all the germination trays and supplies are destroyed and will have to be replaced (not actually that large of an issue as most of these were donated by a nursery and I am certain they have more and would be willing to help). Additional seed stock will need to be acquired as well if those varieties used in 2017 are available like for like for the fall 2018 planting. 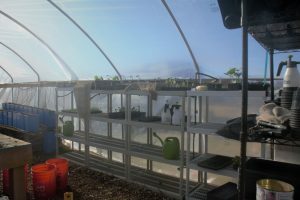 The Before and After pictures related to our operations greenhouse. Due to the current state of operations, I cannot provide a summary that details result from this study. I plan on recovering and completing this study in full detail through a request of an extension. 2 additional growing seasons in conjunction with a watertight irrigation battery version (V2) is needed to fully provide a deliverable that validates, or not, this model. It will take approximately 45 days to completely re-build an area where the study can operate. Much of this time will be used to prepare the site for Fall of 2018 and Spring and Fall of 2019. Some of this time will be used to source, where possible, donations of people’s time and materials that can be used to rebuild damaged or destroyed study components. Following that, another 30 days to germinate new plants for the Fall 2018 growing season and completion of Power Control and Water Control changes. Additionally, water will need to be trucked in to replace the 2500 gallons lost as well as sourcing a cistern that will store what’s required. Because of the climate zone at the site fall crops can be planted late and provide data needed to complete the 2018 information set. The implementation of the following into the project will greatly increase the success based on data from year one and two. Over the course of Fall 2017 and Spring of 2018 we have had many people visit the site. Everything from a group of 3rd graders to Owners of small farms and nurseries. I have provided consultations to 2 agricultural entities, one in Lincoln Nebraska and one in the greater Phoenix Metro Area. I have participated in countless permaculture conversations and discussions in facebook groups, on line forums and Skype calls on the topic. Sometimes as a student, sometimes as a collaborator and sometimes as an instructor/advisor. The Water and Power Control units designed to operate this study at the off-grid location (no power, no water) have generated a good deal of interest and I have shared my designs with many people across the globe. Additionally, I have multiple associates that are currently using those designs to help get water to areas of Puerto Rico where power is still down and the availability of potable water is slim. One of them is looking at how they might use the irrigation battery design as a way to optimize water consumption while producing food. Which is what the study is designed to validate. While these are a side effect of the study as a whole I believed it noteworthy none the less. Because I also teach apiary management, earth building (rammed earth, cob, earthbag, adobe etc), livestock management and permaculture, the students that are at the site also get a brief introduction to water-efficient food systems. As many of these students are invested in sustainable practices the combination pairs very well. Upon validation of the study, I will be producing another set of videos for YouTube and possibly live stream from Twitch or Facebook. These videos, as well as recorded webinars, will serve as a curriculum and guide set for an individual to create this process from end to end.